Rachel Adler Fine Art, New York. James Goodman Gallery, New York. E.J. Sullivan and J-M Tasset, et al., Fernando Botero: Monographs & Paintings 1975-1990 Catalogue Raisonné, Lausanne, Sylvio Acatos, 2000, p. 310, no. 1981/1 (illustrated). The canon of art history is peopled with religious figures from Christ to saints to Madonnas and priests. To this austere tradition, Fernando Botero has added his own humorous images of sacred subjects. In Nun Eating an Apple, the portly holy woman glances to the side as though just having been caught in a devious act. With a Bible in her left hand and the forbidden fruit in her right, she holds the forces of good and evil. Here evil seems to be winning out as the newly eaten apple remains slightly raised above the book. In a 1972 interview, Botero claimed, "I don't paint apples anymore. Oranges and bananas are the authentic fruits of the tropics. Apples are for snobs." It is telling, however, that Botero made an exception to this statement nine years later in a religious image where the apple holds such loaded symbolism. Surely the fall of Eve must have entered the Catholic artist's thoughts upon painting a woman warily eating an apple. The forbidden fruit appears in the background as well, floating or perhaps falling, on the far black wall. While calling attention to the importance of the apple here, these suspended green spheres also serve as a pictorial device. Like the many flies set against large expanses of color in Botero's paintings, the apples create space on an otherwise flat field. The heavy blue drape also adds depth to the shallow image. Evoking a recurrent trope in Baroque art, Botero pulls back the heavy fabric like a theater curtain revealing a dramatic stage scene. Pushed up against the picture plane, like so many Baroque figures, the nun plays the oldest female role in Christian history. 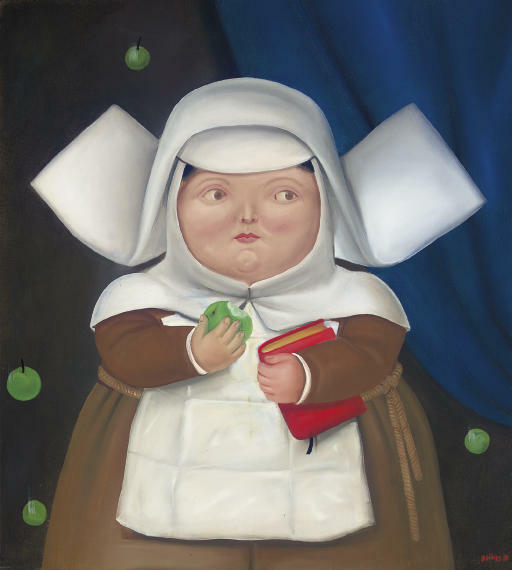 In Botero's revised tale, however, the plump nun is a comedic representation of Original Sin.